I've met so many wonderful Midlife bloggers from all over the world, and Lori Jo (from 50 with Flair) is one of the latest. She's only been blogging for a few months, yet has leapt in with both feet and her blog looks like she's been doing this stuff for years! I thought she might have secretly had a professional put it together for her, but that's not the case at all! She has figured out all the background stuff and on top of that manages to take some amazing fashion photos of herself with a camera, timer and tripod - what a woman! 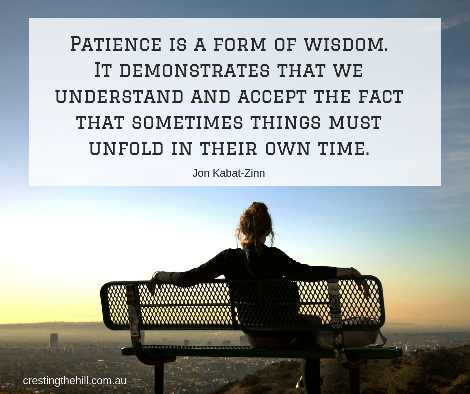 Today she's sharing something a little different to her usual stylish posts and is talking about something we can all relate to - the need to keep working on our patience levels! I can finally breathe again and am practicing more patience and calmer thinking. Time blows by in an instant and I don’t want to waste time and energy with stressing over smaller things. I cannot change random things that happen around me, but I can control how I think, feel and react to them. I have not perfected this, but I am mindful in situations where I feel impatience and reaction crawling all around me. Recently, I was being tested, three times, all at the grocery store. A few weeks ago, I was standing second in line at the “Under 10 Items” check-out at our local grocery store. Another cashier opened the check-out line next to me then pointed directly at me and said, “Next in line, please”, which was obviously me. Just as I started to move over, the elderly feeble-looking man and his wife behind me bolted over there faster than a speeding bullet! Wow! He was bent over using a “Hurry-Cane”, yet was able to straighten up with the cane not touching the ground to blast over there ahead of me. His wife hesitated and gave me a double-take not once but twice, because she knew he was wrong, but I gestured with my hand to wave her on and said, “oh, please go ahead.” I let it pass and was proud of myself for letting it be a small thing. On my way out of the store, an attractive bearded hipster sporting a man bun and wearing shorts and a tank top walked toward me. As he walked past, I noticed that he was also wearing a black bra under the tank top with his cell phone tucked into the left cup. Ya’ll, I am serious, I have never seen this, I must be living a sheltered life in the suburbs. My brain said, “what the heck?? ?”, but I did not swing my head around or react. To each his own, right? Out in the store parking lot, I packed the groceries into my car then started backing out. As I eased out, no one would let me finish coming out of the parking space, but instead sped around to get by. If someone is at least halfway out of their parking space, I will stop and let them finish backing out. How much time are you saving by rushing by and possibly being backed into? I practiced patience. 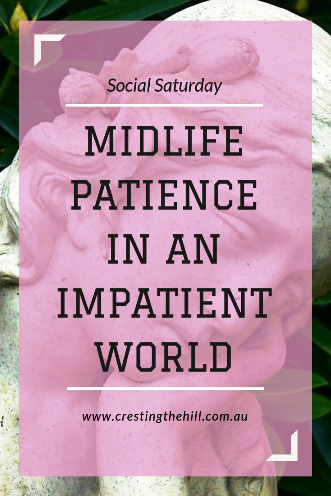 Are you trying to be less stressed and more patient in midlife? I would love to hear about it! Isn't it crazy how sometimes the littlest things like 'place in line' can set us off? 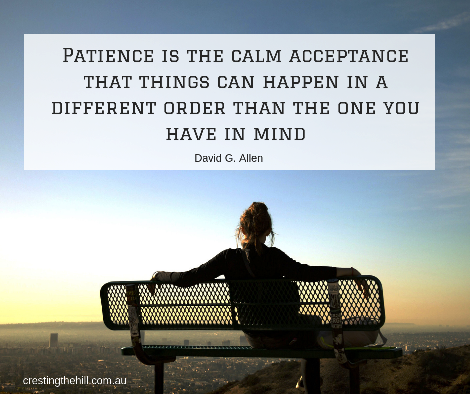 I, too, try to be patient in moments like that - sometimes successfully and other times not so much. Thanks for sharing. I read somewhere that supermarkets were incredibly stressful places - all the choices, the queues, the people, the trolleys etc etc - it's enough to test the patience of a saint at times! Lord give me patience. RIGHT NOW!!! 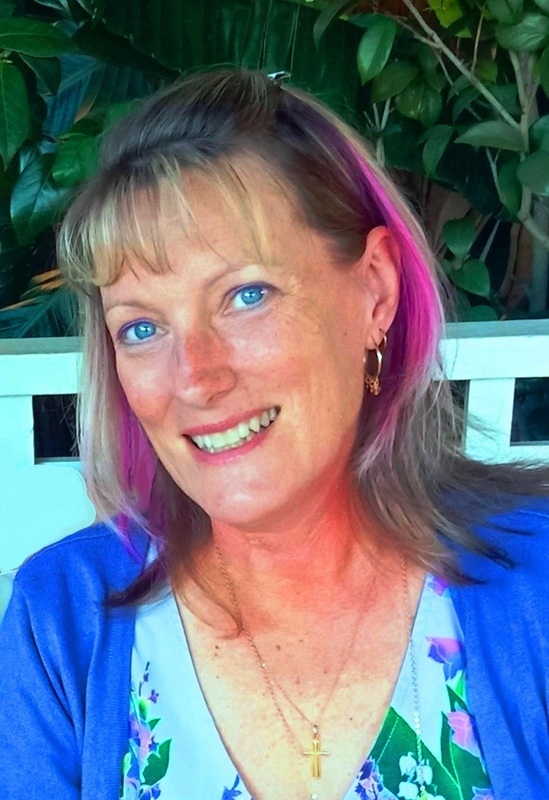 Hi, Lori Jo - It is a pleasure to meet you here. It's incredible how much one little trip to the corner grocery store can teach us. I can usually be patient with big things (she says with confidence), but it is the small things (like grocery store lineups) that can do me in. Funny how that works! Great post! You're right that impatience seems to be contagious at times Annette. Being with someone calm takes the pressure off while being surrounded by foot tappers escalates things dramatically. I've been working on this for, I'm ashamed to say, years. It's always my New Year's resolution. But I've gotten better, really! Sometimes I just close my eyes and breathe. I've also started wearing a red rubberband around my wrist that I snap whenever I think I'm ready to snap. It does take practice! If I wore your red band I would have a blistered wrist from popping myself, so I keep working at it, ha! I think the rubber band is the answer to a lot of our instant gratification urges Jean - a little snap and reminder that we can actually wait for a moment is something we could all do with more of. It always drives me crazy when I'm trying to back out and someone whizzes by. Impatience once again, and I think it is just rude as well. Be careful in those parking lots! I'm actually starting to get a bit paranoid in shopping centre carparks Rebecca - I breathe a sigh of relief when I finally get out and onto the road where nobody is going to reverse into me. I hate it when you’re trying to back out of a parking space and no one will let you leave. What is the point of it, eh? Almost like it is a competition, right? Just another example of "me first" impatience. So do I Rachael - it doesn't kill anyone to wait for 30 seconds, but everyone seems to be in a hurry these days don't they? Nice to meet you Leanne, and also thanks for the intro to Lori Jo! Congrats on your patience in the examples you gave. I am not a very patient person but I try to take the advice of Shelbee from Shelbee On The Edge to think about being kind, and that helps. I'm giving way to other motorists all the time, which doesn't happen much in London! Hi Gail - lovely to meet you too and thanks for stopping by. I think kindness is the root of most people's desire to be patient or to tolerate things that normally upsets them. It might cost us a little in time but the payoff is so worthwhile. I used to have the patience of a Saint. I must admit as I've gotten older it can be a struggle to be patient with some people. I think I've escalated in impatience and finding other people irritating and now I'm on the downhill slope of being a little more tolerant Melanie. I think as I notice my own weaknesses I'm more understanding of others being a bit slow or a bit annoying! Patience definitely comes more easily if you choose to be more mellow with age. Some women become more aggressive or more whiny, but I'm hoping to become more kind and gracious as I age - and with that, patient too! 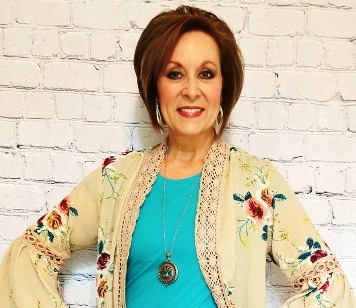 Lori Jo, these are great thoughts and reminders! I am trying to slow down, simplify, say a few less words, and practice patience too. That's a lofty list but I'm hoping they will all work together. I believe that we just allow the world to get so much more complicated than it needs to be sometimes. It does seem that some people have forgotten their manners in lines and in other ways too. Now listen, I was at Target the other day and the dude (I can't call him a young man) walking in front of me had his pants below his behind!! BELOW now just down low. I wish there was something witty and appropriate to say in those situations. Instead we just walk on. The older I get the more I find that I'd really like to speak up but usually don't. It's interesting Kerry - I found when I had an injured shoulder and re-started driving after a break that I was a lot more tentative. Now when someone is slow or annoying me, I try to give them the benefit of the doubt and pretend that maybe they're recovering from an injury too! I like to think I have learned patience as I live a more relaxed life and am in my late 60s but every so often I am reminded that I am not, and it is generally me driving and getting annoyed with another driver...and I honk my horn. Then I am annoyed with myself for doing it!! Thanks for linking up for Life This Week. Next week's optional prompt is What I Have Learned Lately. 15/10/18. Denyse. I have been a horn honker also. I try not to now, to stay calmer, plus so many people carry guns here that you never know who you may be dealing with. Yes, "road ragers" here have pulled guns on each other and been killed over anger in traffic, just not worth it! Thank you for commenting, Denyse. Love this! I'm a "high-strung over thinker" adjusting to midlife as well - just sent my first child off to college - and have also realized that my time and energy are too precious to waste on stress and impatience. I'm trying to meditate a little each day to keep myself grounded. I'm hoping it will give me the grace I need in those challenging moments. Thanks for the inspiration, Lori Jo and Leanne! Overthinking is such a killer isn't it Julia. I'm a big worrier and over-thinker, but I'm working on de-stressing and living more in the moment and being in less of a hurry. I figure my patience improves when I slow down and take life one step at a time. I am trying to excerise this a little more too. Although my little ones are 6 and 2 so it’s a challenge. But away from the kids when I do this I notice it really makes a difference to me!! I was away when you published this Leanne so I'm glad it popped into my mailbox this morning. Hi Lori Jo! Lovely to see you over at Leanne's and sharing some wisdom. Patience is definitely something I have to work on but I know I get impatient because I'm stressed. I've started yoga each day which sets me up for a good morning. My 25 day countdown to a Happy Christmas is also helping put happiness in my day and removing the stress leading up to Christmas. Have a lovely week ladies.